The 16-inch wide cleaning path and easy maintenance features deliver a speedy and thorough clean. The no-tools, shake-out bag system and the QuickKleen fan chamber make this upright a top choice of the commercial cleaning industry. The long-life motor and Vibra-Groomer Brushroll also contribute to this units reputation as a workhorse. 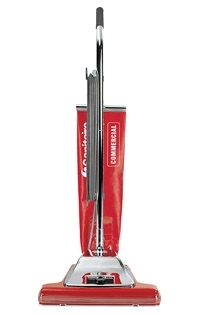 For large areas of carpet cleaning, 18-qt., large capacity vacuum keeps productivity high. No-Tools Bag Release System with metal bag clip makes emptying easy and saves money on bags. Re-engineered long-life motor and chrome steele brushroll with replacemeable bristle strips is built to last and save money.